Ok really, if you are a guy this really doesn't pertain to you and I'd suggest you move on. Sorry; it's an X-chromosome, hormone thing. Ladies. Oh ladies. Since 2009 I've been charting my cycles. It has been crazy, because at least a couple of years of that time I've been either pregnant, postpartum, or breastfeeding. But most of the time my cycles are pretty regular. Short (25 days on average) but regular. And in that time I've observed some things. When I was "being good" on my own, eating mostly the right things, but with out-of-control portions, I'd lose about three pounds every month. Then in one week I'd gain it back. What? Why? Which week, you may ask? I bet you can guess. PMS week. I always blamed it on bloating, and I'm sure that was some of it. But why did I then have to turn around and lose those SAME three pounds the other three or so weeks I had left??? Now that I'm also paying more attention to my fitness and nutrition, I've observed some things. During that week ... I struggle to eat. I actually feel almost as nauseated as I did during the first trimester of pregnancy. Especially my proteins, which I usually look forward to. Instead ... what little I do want to eat ... is carbs. What does this tell me? I may have actually been eating less calories, but the ones I was eating were low-nutrition, easily digestible (easily stored) calories. And since low-prep carbs are more appealing than something closer to raw ... I was probably eating a lot of processed foods and all the lovely sodium and preservatives that come with it. So what have I observed lately? 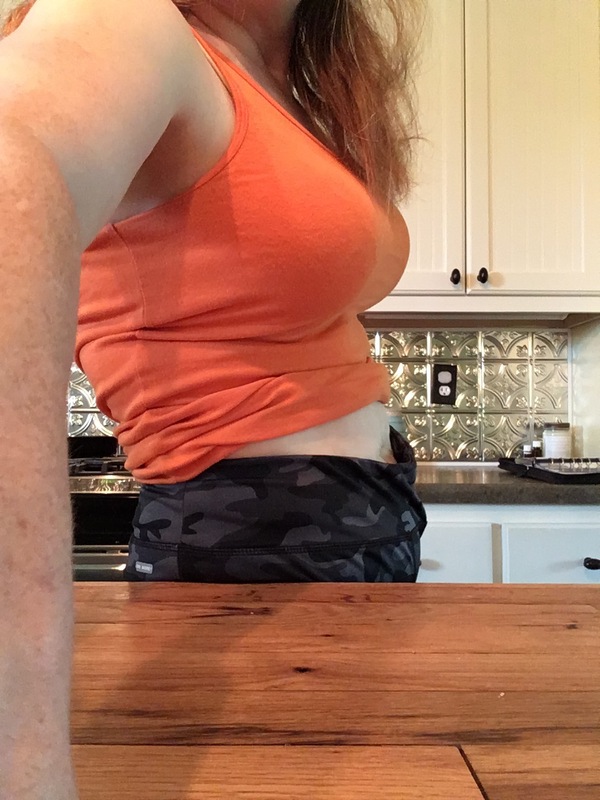 The cravings are similar, and I may not get all my protein in and might be more likely to cheat ... but I don't seem to get the bloating anymore. And I keep losing weight (or at least not gaining) throughout my cycle. It is a lot tougher to get motivated to do my workouts, and I struggle more through them ... but I also know that week is coming when I feel on FIRE and like I could do all six Chisel workouts in one day. So I think about what that day is going to feel like instead of focusing on how exhausted I am and how gross being sweaty feels. And I've kept plugging away ... and now during "that week" instead of breaking out the stretchy pants and thinking even they feel more snug than I'd like ... I find that even my elastic waisted yoga pants are loose around the middle. All these things that have affected you your whole life (or at least, in this case, since puberty) are something you can overcome ... or at the very least learn to work with. If you are interested in learning more, or want to share your struggles with me, I'd love to chat with you. If you'd like to learn more about your hormones and how they relate to fitness and nutrition, this is an informative article that I found to be not only fascinating but helped explained a lot of what makes me feel the way I do during the different phases of my cycles.